An analysis of several important discoveries made by the New Horizon’s mission. Discovered in 1930 by American astronomer Clyde Tombaugh, Pluto was considered by many to be the final planet in our solar system.1 That changed in 2006 following the reclassification of the term “planet” by the International Astronomical Union.2 With the discoveries of Ceres, Haumea, Makemake and Eris, the IAU reconsidered Pluto’s planetary status as Pluto had more similarities and qualities to these objects than to other planets in the solar system. 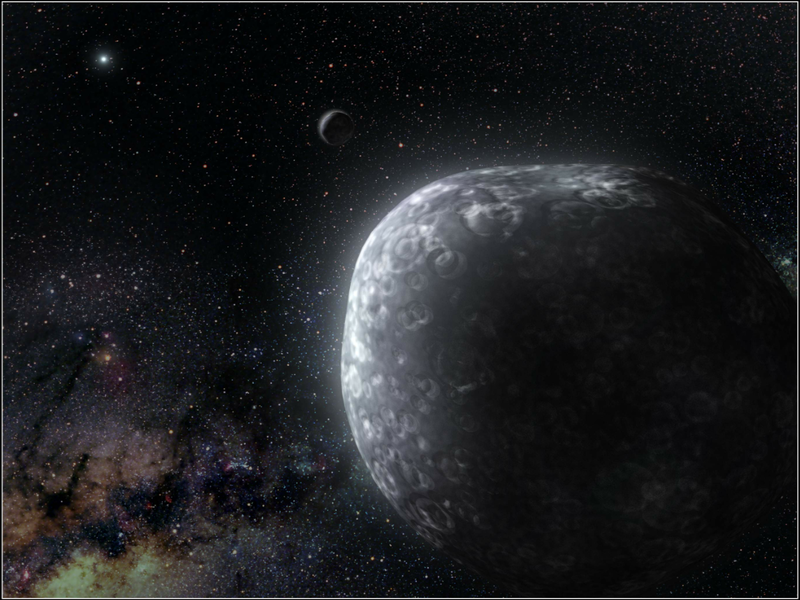 Through the Dawn Mission, scientists were able to observe what are now known as dwarf planets and re-evaluate their classifications as they understood the universe in more depth. In 2015, the New Horizons mission successfully completed it’s mission to Pluto and several important discoveries were made as a result of it’s historic flyby. Additionally, if it wasn’t for Voyager 2’s successful flyby of Neptune’s moon Triton, there may not have been enough interest to warrant a mission solely focused on Pluto. This was largely in part due to the similarities of Pluto and Triton.5 After being initially proposed by another name, the “Pluto-Kuiper Express”6, then being cancelled due to budgetary constraints,7the mission was revived in late 2001. 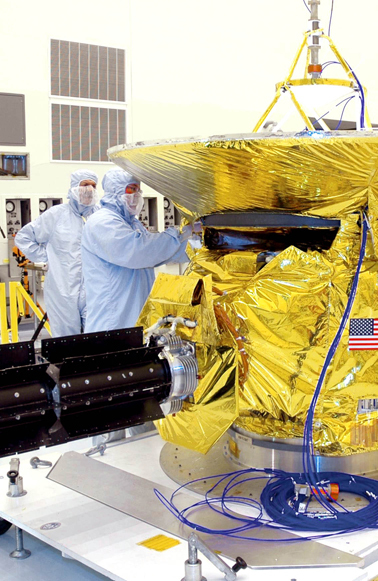 Led by Alan Stern8, a team of scientists and engineers developed the New Horizons satellite over a period of six years. Launching in 2006, New Horizons successfully performed a flyby of Pluto on July 14, 20159 and started transmitting data almost immediately. Countless discoveries were made, however there were a select few that stood out in terms of their scientific importance and unanticipated nature. Pluto’s atmosphere is mostly made up of nitrogen, with carbon monoxide and methane also present. The atmosphere was measured over 160 kilometres, larger than astronomers could have predicted 10. During New Horizons fly by of Pluto, it was noted that the atmospheric haze of the dwarf planet presented a bluish haze, when the dwarf planet is in front of the Sun. Although there is material within the atmosphere which give off a reddish tint, the atmosphere appears blue due to sunlight scattering from haze particles 11. This red tinted material, called tholins, eventually falls back to Pluto, which is why New Horizons saw a reddish tint closest to Pluto’s surface. 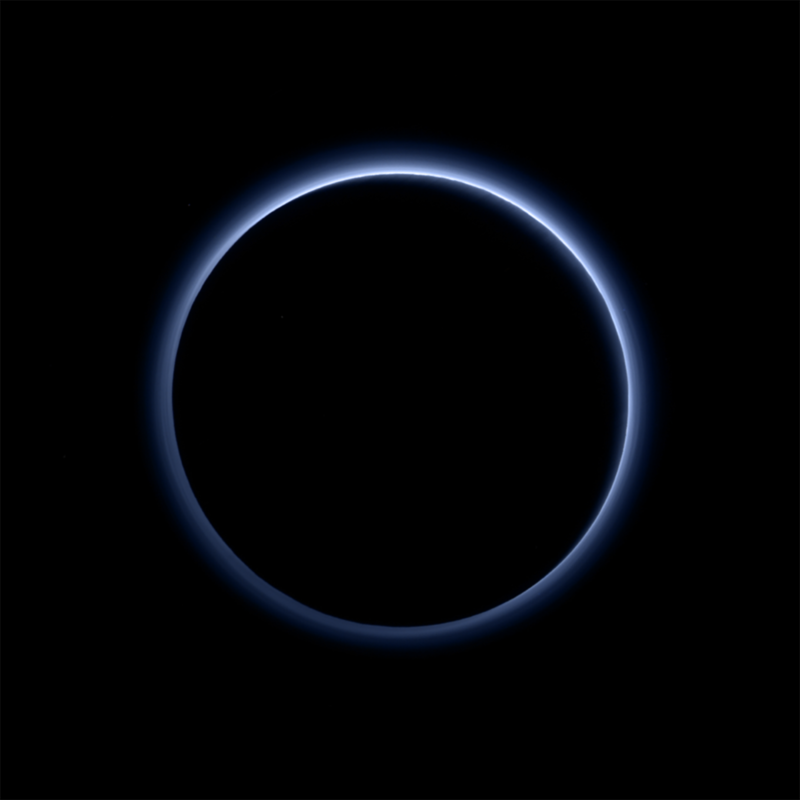 With the photographic information New Horizons was able to capture, scientists saw white patches among the blue haze. They found the patches to be where the sun reflected off Pluto’s surface, with the largest white patch being Cthulhu Region 12. Investigators with the New Horizons missions stated how glorious the sight of a blue sky within the Kuiper Belt was 13. Charon being the largest satellite in relative to its planet is half the diameter of Pluto at 1,214. kilometers made up of rock and ice.14 Charon is filled with mountains and canyons stretching over kilometers across its surface. Its largest Canyon stretches more than 1,699 kilometers which is four times as long as the Grand Canyon. These observations were possible through as NASA’s New Horizons spacecraft passed by Charon on July 14th, 2015 14 . Through this mission they were able to observe Charon’s red polar cap. The polar cap is caused by complex compounds called tholins 21. Tholins are a result of energetic radiation processing of hydrocarbons through Charon’s extreme temperatures in its atmosphere as gasses from Pluto escape and are trapped by Charon’s gravity 15. The surface of Pluto is mostly nitrogen ices and some carbon monoxide 16. It has been estimated that the surface crust is 250km of ice 16. Sputnik Planum (SP) is a renowned as the largest known glacier in the solar system. An ironic discovery for the Milky Way’s once smallest planet. This massive glacier is estimated to be 4km thick and 20 degree radius. SP is a probable impact basin located near the anti-Charon point, meaning that it is on the direct opposite side of the planet that Charon remains 16. Sputnik Planum is a unique discovery because of its location. The location resulted in the a true polar wander (TPW) for Pluto 16. A TPW is when a solid-body rotation of a planet on which the location of the north and south poles change, or “wander” 17. The movement is caused by the plant correcting itself so that the largest moment of inertia is in line with the spin axis 17. Although planets may appear ‘round’, they often have different moments of inertia because they are not perfectly symmetric. The Earth, for example, has three different moments of inertia 17. Sputnik Planum is an anomaly; The probability of an anomaly occurring that close to a tidal axis is about 10% 16. The low probability adds to the the unique characteristics of Pluto’s structure. “The ability of any mass to reorient a body is counteracted by the plant’s elastic lithosphere, which may preserve an earlier rotational or tidal bulge”. The significance of the geographic presence of SP is that, at present, no bulge has been detected on Pluto. The Kuiper Belt is a disc-shaped region that extends beyond Neptune and is approximately 30 to 55 astronomical units (AU). 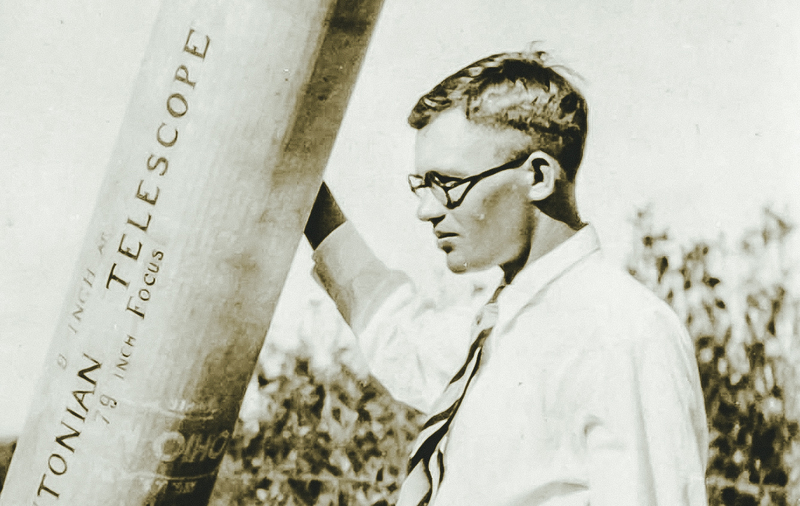 The region was named so after Gerard Kuiper who, in 1951, proposed that a belt of icy bodies existed beyond Neptune’s orbit to solve the mystery of why we see comets. In 1992, Dave Jewitt and Jane Luu discovered strange objects beyond Neptune, which astronomers call Kuiper Belt Objects (KBOs). While the Kuiper Belt is largely made up of icy bodies and comets, the most famous feature that exists in the Kuiper Belt is the dwarf planet known as Pluto. Objects within the belt are said to be remnants from when the solar system formed around 4.6 billion years ago. The construction, launch and data retrieval from the New Horizons satellite was a tremendous success for NASA, producing mountains of new data. Several important discoveries were made, including advanced information about the atmosphere of Pluto and the geology of it’s moon Charon. The New Horizon’s satellite will continue to operate and relay data, it’s next target a Kuiper Belt Object named “2014 MU69”. Dickinson, Terence. “NASA Sidetracks Pluto-Kuiper Express.” Toronto Star [Toronto] 01 Oct. 2000: n. pag. Print. Hand, Eric. “Feature: How Alan Stern’s Tenacity, Drive, and Command Got a NASA Spacecraft to Pluto.” Science | AAAS. N.p., 11 Feb. 2016. Web. Hartmann, William K., and Chris Impey. Astronomy: The Cosmic Journey. Pacific Grove, CA: Brooks/Cole, 2002. Print. “International Astronomical Union | IAU.” International Astronomical Union | IAU. N.p., n.d. Web. Donald Savage. NASA SELECTS PLUTO-KUIPER BELT MISSION FOR PHASE B STUDY. 2001. Print. Shepherd, Leslie R. “The IAA Interstellar Space Exploration Committee (ISEC) Its History & Evolution.” Acta Astronautica 44.2-4 (1999): 79-83. Web. Stern, Alan. “What If Voyager Had Explored Pluto?” NASA. NASA, n.d. Web. Stern, S. Alan. “The New Horizons Pluto Kuiper Belt Mission: An Overview with Historical Context.” Space Science Reviews 140.1-4 (2008): 3-21. Web. “US Spacecraft Flies by Pluto after Nine-Year, 3 Billon Mile Trip.” Cyprus Mail (Cyprus). N.p., 14 July 2015. Web. Parnell, Brid-Aine. “The Cthulhu region – pg.2.” Forbes. September 12, 2015. https://www.forbes.com/pictures/flmk45fged/the-cthulhu-region/#21edb89a6a3e. Gipson, Lillian. “New Horizons Finds Blue Skies and Water Ice on Pluto.” NASA. October 08, 2015. https://www.nasa.gov/nh/nh-finds-blue-skies-and-water-ice-on-pluto/. Talbert, Tricia. “Pluto’s Big Moon Charon Reveals a Colorful and Violent History.” NASA. October 01, 2015. https://www.nasa.gov/feature/pluto-s-big-moon-charon-reveals-a-colorful-and-violent-history. Grundy, W. M., D. P. Cruikshank, G. R. Gladstone, C. J. A. Howett, T. R. Lauer, J. R. Spencer, M. E. Summers et al. “The formation of Charon’s red poles from seasonally cold-trapped volatiles.” Nature 539, no. 7627 (2016): 65-68. Keane, J. T., and I. Matsuyama. 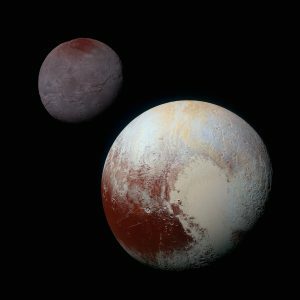 “Pluto followed its heart: True polar wander of Pluto due to the formation and evolution of Sputnik Planum.” In Lunar and Planetary Science Conference, vol. 47, p. 2348. 2016. Steinberger, Bernhard, and Trond H. Torsvik. “Absolute plate motions and true polar wander in the absence of hotspot tracks.” Nature 452, no. 7187 (2008): 620-623. Keeter, Bill. “One Year Later: New Horizons’ Top 10 Discoveries at Pluto.” NASA. July 14, 2016. https://www.nasa.gov/feature/one-year-later-new-horizons-top-10-discoveries-at-pluto. Greicius, Tony. “New Horizons Receives Mission Extension to Kuiper Belt, Dawn to Remain.” NASA. July 01, 2016. https://www.nasa.gov/feature/new-horizons-receives-mission-extension-to-kuiper-belt-dawn-to-remain-at-ceres/.